Customer Attributes Magento 1 extension is a powerful tool to get the necessary data directly from your customers in an easy way. Place fields on registration page to know age, preferences and interests, receive documents and all other information you may need. Add any customer attributes you need to the registration page. Gather important customer data and easily sort customers by their attributes on the backend. Our Magento 1 customer attributes extension enables you to create unlimited number of additional Magento registration fields to collect as much information as you need. You can let customers upload documents, images, let them select from available options, type their own text, leave comments, etc. Collect info about your customers to fulfill more of their needs. Find out the key reasons for choosing your store as well as the things your customers are not satisfied with. Know your customers’ personal information such as date of birth, hobbies and make specials according to this info. For example, you can send discount coupons on special occasions! Let customers feel they are taken care of and they will pay you back. Gather information from as many customers as you can by displaying attributes both at the registration page and billing info page (for the customers who register during checkout). You can also check out our Order Attributes module that collect customers' address info. Get graphic or text information by creating customer service attributes of different types. Let the customer answer open or closed questions, upload any file, e.g. photo, document or a passport scan or choose from the list of options. With ‘Manage customer attributes’ grid you can see all the details of created attributes at a glimpse. The grid contains information on the attribute type, sorting order and where the attribute is shown. Optimize the list of attributes in the way your customer won’t get tired while filling in the Magento registration fields. Specify the order of attributes display for better information perception. Now all the custom attribute fields that you've created for customers will be automatically displayed in your backend in the same order. This option will significantly optimize customer info processing by allowing faster and easier find necessary fields in the admin panel. Sometimes it’s really not necessary to bother customers during the checkout. Now you can remove the custom attributes from Account Information and Billing Information pages if they had been filled in before (e.g. during registration). With the reports tool you can easily keep track of customer attributes usage. See detailed statistics based on various selectable attributes such as checkboxes, multiple selects, drop-downs and radio buttons. Use customer data for your marketing goals. Uploading images in addition to text descriptions will make your registration page both more visually attractive and more user-friendly. Some options may be difficult to understand, so the images will help customers to make the right choices. Have a long list of attributes? Need to ask for additional information only when a customer selects a particular option? Make attributes display only when a particular value of other attribute was selected. E.g. show the list of European divisions to choose from only when ‘Europe’ region is selected. Or ask for detailed description of the issue if the customer’s answer for ‘Are you satisfied with our service?’ is ‘No’.You can ask what customers like about your products the same way. Use static text Magento 1 custom fields to display the info, which customers should learn during registration process (e.g. terms and conditions). Let customers use any custom attribute for login either instead of or together with email. If used together, customers will be able login either with email or with the custom attribute. So you can allow customers to login with their usernames instead of emails for example. Now you can create an additional custom attributes to make the password recovery process even more convenient. Let them use the same custom attributes as they use while registration to retrieve forgotten passwords. The module allows selecting store views on which to display the attributes in Magento registration form. Setting unique field title and default values for each store view gives much convenience, if you have a multi-language store. 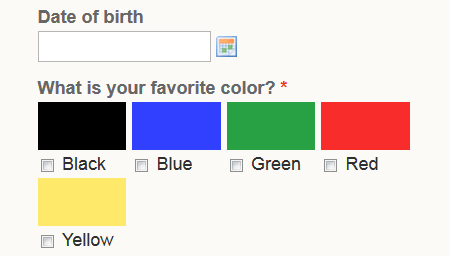 Make your customers pleased by creating the custom attributes in their native languages. You can also remove or add fields to registration form for certain store views in cases, when some fields are country-specific. With this option you can enable standard registration fields right on the page of account creation so that customers won’t have to specify these data during the checkout process. Add attributes to ‘Manage customers’ grid, sort and filter customers by the attributes. Find common features to define customer segments and adjust your marketing accordingly. Admin can fill in the attribute fields when creating a customer account from admin panel. Both customers and admin can edit attribute data. Admin can fill in attribute fields, when creating a customer account from admin panel. Of course, admin can restrict editing of some fields for customers. 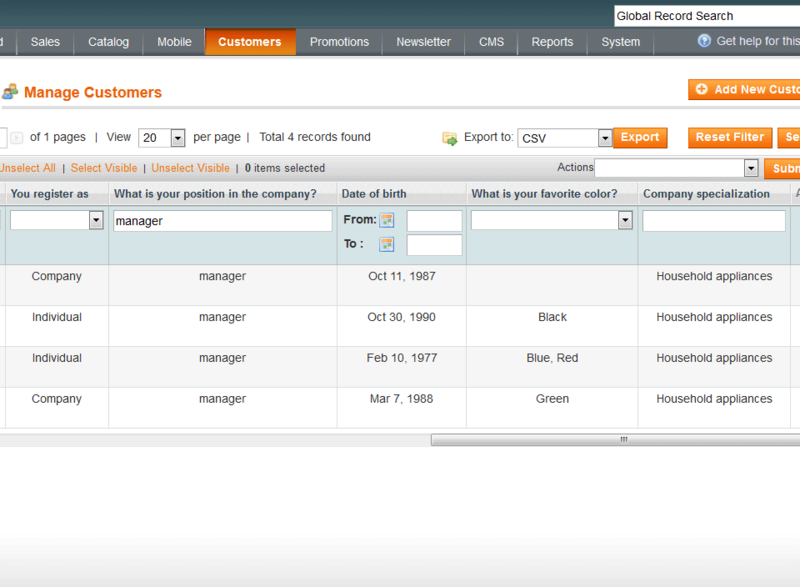 You can display attributes on the order grid to see important customer data, e.g. billing company, right away. This makes order processing faster and more convenient. The attributes can also be seen on order view pages. Displaying attributes on the order grid, you can analyze the connection between customers’ personal info, let’s say hobbies, and the products they buy. This will help you to create more targeted and thus effective marketing campaigns. You can automatically activate new customer accounts for the selected customer groups or email domains. 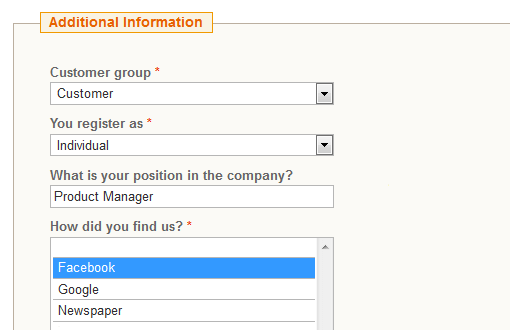 Also, with the extension, you can let customers to select a customer group during registration. With the Customer Attributes extension, you can enable all new customer accounts that are in the 'Pending' status in a mouse click. Use the 'Activate' button in the module settings. You can include custom attributes in customer-related emails (e.g registration confirmation, password recovery, etc.) as well as in emails for store guests such as special offers, sales events, reminders, etc. Now admin users can manually specify additional customer attributes when they create customers for orders placed from the admin panel. 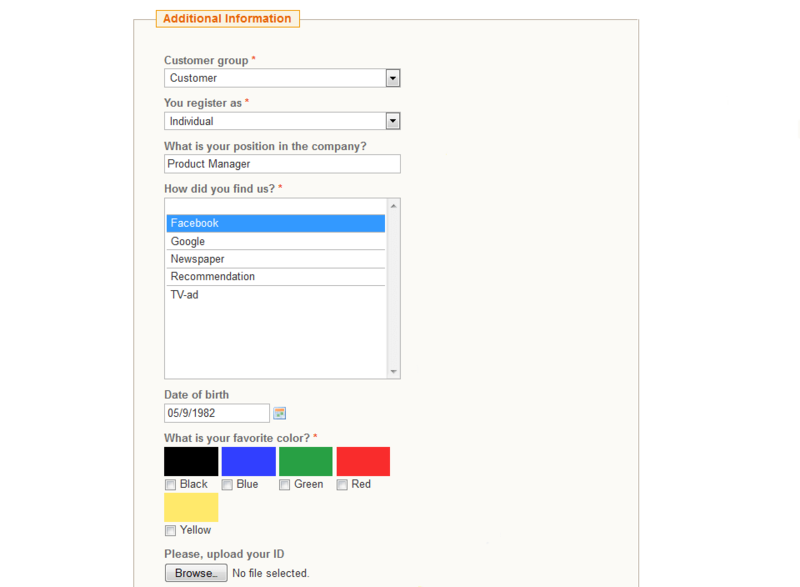 Customer attributes can be also added to already existing order pages. It is possible to export customer attributes using standard magento export functionality. Multiple options for attribute display: registration page, billing info page, customer account, ‘Manage Customers’ grid, order grid, order view pages. You can enable and disable display of fields for each of the above locations. Ability to display customer attributes on the list of customers, which is displayed while creation of order from admin panel. By default all new registered customers of Magento store are activated automatically. Customer Attributes extension gives you a possibility to manually approve customers after their registration. This measure ensures that the account is associated with an actual person, rather than with a computer that is setting up fake accounts. In case admin hasn’t activated a customer, the user can’t proceed to checkout or log in. Instead of these operations he receives the note of non-activated account. With the help of Customer Attributes you can set up the notifications about newly registered customers. This useful option allows you to activate new customer accounts in time and keep a track of every new registration. If it's required you can sent these notifications to several admin emails. Send welcome nurturing emails for new subscribers and gain more customers’ loyalty. To see the way Customer Attributes tool works please watch the extension video review. Use our Magento GDPR extension to fully comply with the latest GDPR requirements and keep all customers' data in accordance with the law. How to add new attributes inside a form? Having decided to add new attributes inside a form, all you need is to insert a special code into the template. Go on reading to copy the code and make all the settings correctly. Can I use created customer attributes on sales order grid? Yes, you can add new Magento custom fields to the sales grid to sort and filter by them. Is it possible to export/import created customer attributes? Customer Attributes extension provides an option to export submitted values. However, there is no way to import this data. Can I use Customer Attributes only in one store in a multi-store configuration? Each customer attribute created by our extension can be seen on one store view and hidden on another. Can I use different customer attributes in my multiple store views? Yes, it's possible to set different attributes per different store views. If you have a multi-language store, you can create the attributes in customer native language and remove/add fields to the registration form depending on the store view. Will new attributes be seen when creating a customer from backend? Yes, all the new custom attribute fields for a customer will be automatically shown in the same order in your backend. You can add custom attributes to a customer profile and see the result immediately in the backend. Read on to see the screenshot. How can new attributes be used with Magento API? You can use new attributes with API having created two files and added them to different directories. Continue reading to see how to make correctly. Can I add created customer attributes to order emails? Yes, you can add the attributes to all customer related emails using special variables in the custom attributes configuration. Read on to get a step-by-step instruction. 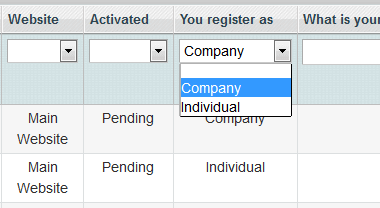 Can registration fields be changed depending on customers’ answers? Yes, Magento registration fields can be changed, since the module has dependent attributes functionality. This means questions display specific questions depending on the answer to the main question. Will this Customer Attributes extension work with one page checkouts? Usually Amasty extensions have no conflicts with other 3-d party modules, but in case there will be any, just contact our support team. The module is 100% compatible with our One Step Checkout plugin. Are customer attributes available using the Magento API? Yes, attributes created using Customer Attributes extension are available via Magento API. These attributes work in the same way default do (like first name, birth date etc.). All actions that are possible with the default attributes, are also possible with the custom ones. How to output the customer attribute value in the e-mail template? For getting the variable in the email template you need to create a new template, get the customer attribute value to it through the code and assign the new template. How to get/output customer attribute value via PHP code? With the usage of the module, you can output the value using a line of code. The patch and the settings are highlighted in a complete answer. I have used the Customer Attributes module on several sites and it is one of my go-to modules to install on any new site. Works brilliantly, and support is excellent. Like many situations when combining several Magento extensions, they do not always work well together. Dmitry was extremely helpful fixing a problem that was being caused by a conflict with an existing extension from a different provider. The extension works perfectly. This is an outstanding company to do business with. This extension worked great out of the box, and when we needed some help with conflicts with other extensions on our site, they fixed it super fast. Highly Recommend Amasty and their products. Thanks! Great extension / super module ! This extension is really as described by the developer. We took the installation as well and we must say that Amasty team did all the necessary to make it work perfectly. And all this very fast. This extension is really as describe by the developer. We took the installation as well and we must say that Amasty team did all the necessary to make it work perfectly. And all this very fast. I needed the customer attribute extension for some additional details we needed from our customers during the registration process. The extension worked very well for us. We ran into a few issues because of conflicts with other modules on our website and the Amasty support team resolved them for us and the turnover time from support is very quick and in no time I had all my issues sorted. I am very happy with the extension and the support I received. Ultimate functionality for reasonable price. The plugin has been running for a year already, and we didn't have any issues with is so far. All settings are correctly displayed on the checkout and bring us tons of useful data every day. The one more great advantage is that the settings are very intuitive and can be easily configured by any newbie like me. we have a shop where there is already a customer activation available and with this extension now a second time would have been. Thanks to the fast and free support, which eliminate this part of her extension. I am always very pleased with the extensions and the support of Amasty. Any time I need an extension, I go to Amasty first. They have most of what I need, but most importantly, they back it up with fantastic developer support. The Customer Attributes extension ran into a couple of software conflicts with other author's software. Amasty fixed the problems for no extra charge. Great extension ... even greater support! We bought the extension for a customer and it works exactly as promised. Amasty's outstanding support made it compatible with OneStepCheckout extension and fixed another extension compatibility issue we hadn't even been aware of. Absolutely recommended! Amasty is one of the best developer for Magento. their work is always excellent. this is not my first purchase from Amasty and it will not be the last one. I recommend Amasty for every Magento Shop Owner. We needed an easy way to define additional customer fields and also to be able to use these fields in our emails. This module did exactly that. After a Magento upgrade along with the installation of other 3rd party modules, we also encountered some compatibility problems. However one of Amasty's developers logged into our system the next day and was able to identify and fix all of the problems. We are very satisfied with our purchase and the support received. Would recommend to everyone that need to quickly add customer attributes. The only thing better than this extension is their service. Have always trusted Amasty and will continue to do so. Great extension, must have ! An support so fast !! The product works as advertised and is a huge help to us. My standards, in general, are very high as a result of my experiences with Amasty. They set the bar in customer service as well as development. In fact, they set the bar so high, some other developers aren't even aware that the bar exists. Ha! Our company continually finds value in Amasty's product line. The broad spectrum of tools and enhancements for both end users and admins truly take Magento to the next level. Thank you Amasty for yet another excellent tool. Keep up the great work, the Magento community needs you. I am tremendously impressed with Amasty's level of support. In the past, Magento Extension Developers have simply disabled the other party’s extension that was conflicting with theirs and acted as though it was an acceptable fix action. Amasty, on the other hand, took the time to make adjustments in code that allow our existing extensions to work together with theirs. Then without being asked, they provided me with the changed files and the backups that they made in case I needed to revert the changes. I applaud their effort, support and attention to our needs. Amasty has demonstrated an exceedingly high level of professionalism and efficiency. It is evident that Amasty has a concrete understanding of both coding AND a sincere concern for the needs of your customers. I stand firm in my belief that Amasty is hands down the best Magento Developer on the market today, and I will continue to tell every Magento user that will listen. Bravo. Had an issue, being solved very effectively and quickly by the support. RFE: will be very nice to be able to define a custom pattern/regex for field validation without having to touch PHP code. Really easy to use, we have added several custom fields to the customer profile, and they can be automatically edited in back and front-end. If ypou need to add fields to the customer profile, this extension is perfect. The customer service from Amasty is excellent, we had an issue and they didn't give up until it was solved. Installed the extensions, but it conflicted with another module - hopefully the Amasty team were happy to help out and every thing works perfectly now. Great extension and great support from Amasty! Just 2 words: great and handy. This functionality has greatly helped me in sales analysis. I've added my new custom attributes to the sales report and now I have a more detailed picture. This is a good mod to get to know your customers better. I only wish I could replace the native Magento registration fields with the custom ones. The extensions widens marketing opportunities as I can collect the info I need and then use it in my promotions and special offers. However, I need some specific features added and already emailed them to Amasty. Waiting for the answer. I'm selling gifts for pets. 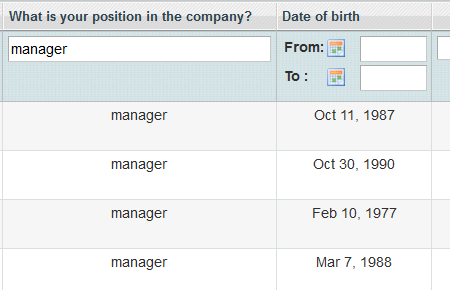 This extension lets me add additional fields to discover pet's name and date of birth. I further use this info for my promotions. Works great for me! All custom attributes you make you can choose to display in the order PDF Magento makes, which is also useful in my case, because I do not want store owners name to be on the PDF, but rather the company's name to make it look more official. Excellent support from module developers. I bought this extension only about a week ago, but I already have something to say :) The module is not difficult to install, it comes with very detailed instructions. But we had some problems with our theme and needed customization. Amasty team solved the issue in just a couple of days and for a very reasonable price. Good product and fantastic support; well done! One more quality tool from this developer. Smooth installation and quite intuitive interface, that's what I appreciated most. I easily coped with the settings - everything is properly displayed on the frontend. What was really disappointing is that I still don't know how to change time and day formats for corresponding attributes. Please, add this option to the app in future. I had some problems with module installation and i was sorted out in a short period of time. Special thank you to Dzmitry Smolik :)! Nice app that made my life easier. Due to quite detailed manual, I managed to configure the settings myself - lucky me;) Before installing the app I wasn't sure it would work with my current ECO theme. But the support guys fine tuned the app for me in about a day or two. I highly recommend the tool if you need to collect some customer data without any additional efforts. Thanks a lot, guys, you did a good job on this extension. It is easy install, easy to configure and realty easy to use. We managed to do it all ourselves without any support tickets. That felt really nice :) I strongly recommend the module to all magento store owners who need to unobtrusively collect customers’ information. The plugin works exactly as described and looks really nice on the frontend. It works for my magento 1.9.0.1 version. The installation was absolutely painless and everything seems to be ok. The only issue is that their support team never works during the weekend, so I had to wait for two days until they replied to my ticket and helped to eliminate the conflict with another app. Nevertheless, the tool itself is very handy and properly displays all specified attributes on the frontend. We provide a variety of customer services. For such business it is crucial to have some kind of profile for each customer, additional info helps to make the best individual offer. Our online operators have tried asking a couple of questions during online conversations with customers, but this idea didn’t work out well. People are not ready to answer questions, often customers even get annoyed. We started to look for some solution and turned to this module. And it does exactly what we were trying to arrange! There is no more need to bother clients with any additional questions, all we need to know fits in just a couple of fields. Brilliant solution! Our customers and our staff are both really happy! After we installed the extension, a conflict with the 3-d party module appeared. The problem was resolved within several hours by excellent support. The module itself is also pretty useful for marketing purposes. Now we offer each customer a B-day gifts and discounts and collect some very useful data. Customers are satisfied and more loyal, staff has better basis to develop marketing strategy. I do recommend this module to everyone! Thanks! Quick and easy install, and options in the backend are easy to configure. 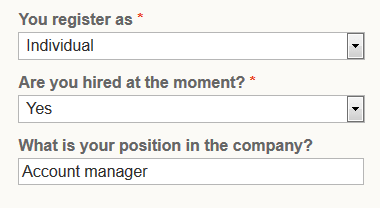 The one issue I had was with placement in the checkout for these fields. Their support helped get it moved where I wanted it, and hopefully they are going to add this feature to a future release. Support is always good and will make sure they get things right. This is a very good extension. It’s easy to set up and configure, it is designed pretty well .Regular releases with new features and possibilities, timely updates are also a plus. Whenever I'm looking for a new feature I go to this company first as I know I can rely on them to help us work out any of the kinks that might arise. Worth every penny as opposed to the FOC ones that are out there. Very versatile and great support once again from Amasty. очень мощный модуль по своему функционалу. на самом деле еще надо знать, как им пользоваться, потому что можно комбинировать фичи и получать интересный фидбэк от покупателей. до всего доходили своим умом, поэтому есть совет: не просто давать мануалы, а показывать примеры комбинации настроек, юзер кейсы те же. в целом больше проблем не возникало, есть русскоговорящий саппорт. The extension is good and I can't say anything bad about it. But please add support on weekend. I had a conflict on my store and I had to wait till Monday (turned the ext off before help came). We have a store and an offline shop, so we have a lot of direct input visits, also we run a lot of offline ads so it always was a trouble to identify the source of traffic. This extension allowed us to ask people before registration where they came from. Based on this we could see how much they bought and what they bought and leverage our ads budget. Unfortunately, we didn’t use other features that much so I can’t say how they work and we didn’t need any assistance as it was easy to set up this single feature. I also appreciate the quality of support. We had a trouble and it looked like the customer couldn’t complete the registration. I called the support and we were helped quickly (the reason was not exactly in the extension… but nevertheless). amasty is a very reliable vendor, and we are using several extensions on multiple stores. no serious complaints so far, the code is clean, we did several customizations and everything seemed to be logical not only on frontend/backend but also in the code structure. this particular extension can slow down the pages a bit (not everywhere, though). we received a couple of recommendations how to speed it up - however, looks like it's not completely the module's fault. still, the features are great and support is very friendly. This module works as advertised. Had an issue on install (which was my own fault), and the support team had me up and running very quickly. I think, there is nothing what they could do better. Thanks a lot. I chose Amasty over a competitor's extension and it was worthwhile. There was an error after the installation of the extension, but the support took care of it within 2-3 days after we submitted the access info to them. We used the extension to enable filtering of orders by a customer attribute that we created. 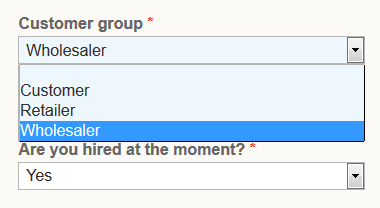 I needed an extension that I can specify sales reps for each customer. Since I already had a couple of Amasty extensions that I was happy with, I chose Amasty again and I was right! After installation, I had a small problem with a 3rd party extension but they worked with me to solve the problem right away. I strongly recommend to choose any Amasty modules. Thanks Amasty! We had an urgent problem. Phoned in and a few hours later the problem was solved by Dzmitry. The extension works very well, I am especially impressed with the inclusion of being able to attach specific files to each contact. We have many different types of customers, and it would be great to see an, "add tab" feature in the backend to keep the fields grouped and tidy. Great extensions - great team! Out of the box you get a quality product that needs no improvements (except for some minor issues). Support team really does it's best. We'll definitely keep in mind Amasty when looking for some more extensions. Installed without issue, and worked exactly as described. Had a few questions answered incredibly fast in a simple, easy-to-understand manner so even unexperienced magento-installers could handle it. Highly recommend the work Amasty is doing - all at fair prices. The extension does exactly what we need. We installed this on magento 1.7.0.2, there were some problems by some conflict with another extension but amasty team resolved it perfectly. Thanks Dzmitry and all the team. Very easy to use and has many useful features. The functional possibilities that our website can now preform has increased exponentially. And if that wasn't enough, when ever i ran into problem their customer support was more than happy to help. Very fast response times and very detailed in solving problems. Having looked at all solutions on Magento connect, this module far and away stood out from the crowd. We commissioned Amasty to make a modification for our specific needs, this was taken on with enthusiasm and above all, our brief was fully understood from the outset. Our modified extension now has the facility to include images - for our purposes this was very much needed! - I believe this will be released as a future update to the module. The customer service provided by Amasty has been nothing but exemplary. Support have answered all questions posed to them with speed and efficiency. Amasty have made our list as one of the best developers for Magento we have found and would most certainly deal with them again as well as recommend them to anyone looking at this module or any other they provide. I am very very satisfied with this great module. Also i want to mention the terrific supportive persons behind Amasty - i had some problems with another extension which blocked a feature and help was very fast and very professional done. Thanks Amasty for your great help, we see us again for sure! Really great extension. Works out of the box, almost none coding. Works great with import/export because the use magentos attribute logic. Purchased, installed and then have an extension conflict with the 3-d party extension. Amasty support proposed and rapidly get excellent support from Alex, thank you for this! does exactly what it suppose to do. Also the support 10/10 nothing to say just thanks and Yes i do recommend this extension. i tested this extension on magento 1.7.0.2 and works well. Thanks guys! I've been using your extension since version 1, all my clients love the option, and it saves me time and makes a huge impression on customers visiting their sites and my site. A++ in my books. Thanks again! MUST HAVE EXTENSION! 5 Stars with everything from the extension to support. Many thanks to the Amasty team for their extension which works wonderfully, but also their support in configuring the customer attributes extension to work within my site. They went above and beyond and I am really happy with the results. Thanks!!! I installed this on 1.7.0.2 and everything for the most part worked perfectly. I contacted support with a few questions/issues. The response was quick, friendly, patient, good English, and solved my issues - something that isn't always common with Magento extension developers. One of the points I raised was actually a Magento configuration setting, but support was pleasant enough to answer it anyway. The point that was related to the Customers Attributes extension, support actually did a custom fix on my site to get it to work. Based on the support interaction alone, I'd recommend Amasty extensions. Useful extension that does what is claimed. Support is excellent. Developers went in promptly, corrected the installation and made it all look good too. This mod is one of those that I feel is essential.. we use it to collect additional information about our customers when they register... including the uploading of certain documents we require to sign up (reseller tax certificate for instance). I highly recommend looking into what this mod can do for your store.... there are many possibilities. An easy one is to find out how new customers heard about you - Google, Bing, website, referral, etc. Amasty support is top-notch w/ emails being answered usually the same day (sometimes within just an hour or less). – Compatibility with several 3-d party checkout extensions, minor improvements. – Fix for automatic login after registration when customer activation enabled. – Precise adjustment for attribute display on front end. – Ability not to display attribute fields in Customers Account Information page and Billing page, if they were filled in before. – Trigger for 'Date' field. – ‘Type’ field added to Customer attributes grid. – Fixed issue with customer group selector. – Fixed issue with Admin Access Control List. – Fix for customer group selector. – Improved compatibility with custom design themes. – Fix for unique value check on billing information step. – Fix for deletion of customers. – Bugfix for visible on frontend setting being saved incorrectly in Magento 1.4.2. – Bugfix of attribute display for cases when 'All Store Views' option is selected. – New attribute type - file upload. – Selection of customer group on registration. – Bugfix for table alias, table index keys, customer group selector, incorrect display of Yes/No attribute. – New attribute type - 'Yes/No'. – Fixed issue with dependent attributes in IE browser. – Fixed issue with validation of mandatory attributes during saving of customer accounts. – Dependent attributes. This feature lets you display certain attributes only when a particular value of other attribute was selected. – Ability to make fields read-only. Customers can view the values specified in such fields and not edit them. Only admin can edit such fields. – Static text field. With the help of this field you can to display text to customers on registration or customer account page. E.g. terms and conditions. – RUT validation. Specific field validation for Chilean market. – Ability to display attributes in account information section on order view pages in admin panel. – Additional setting for display of attributes on registration page. – Ability to display customer attributes on the list of customers, which is displayed while creation of order from admin panel. – Compatibility with Magento 1.6. – Improved compatibilty with 3-party customer-related extensions. – Ability to use any custom attribute for login either instead of or together with email (if used together, customers will be able login either with email or with the custom attribute).